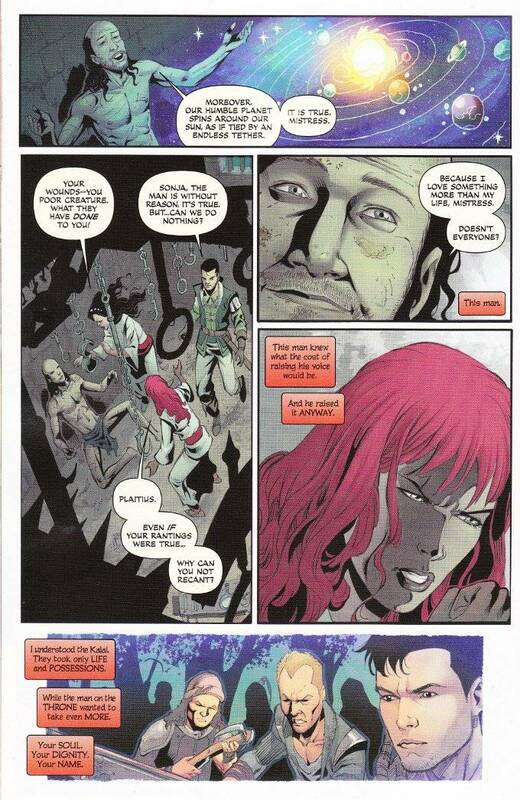 I've grown used to Red Sonja being a great read since Gail Simone and Walter Geovani took over the monthly book. There has been a good mix of action and humor, well displayed and well drawn. 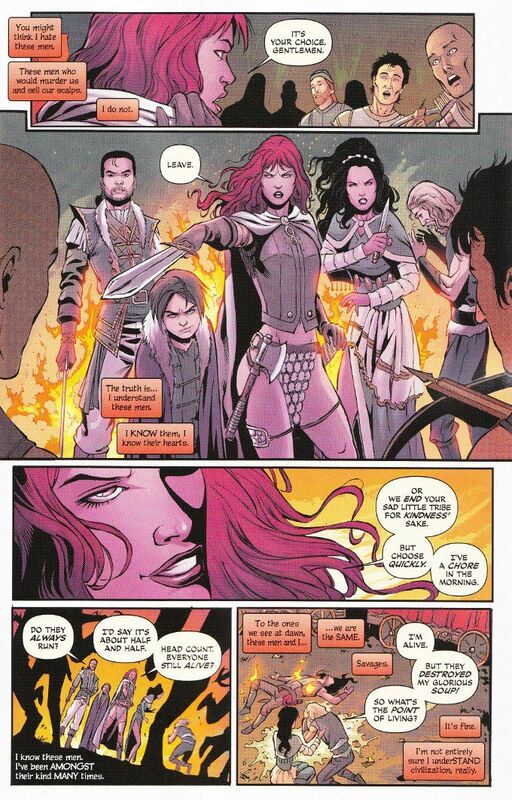 Yet I didn't quite expect Red Sonja #11 to be as good a book as it is simply because I did not expect this book to be about Something Important as well as a rollicking good sword and sorcery tale. The book opens with an action-filled recap which reintroduces us to the current plot. Sonja's current quest involves the retrieval of six artisans in order to secure the freedom of a thousand slaves. After the recap, we return to the business of Sonja's efforts to rescue the fifth artisan. An astrologer by trade, this artisan has some rather revolutionary ideas about the heavens and how they operate. These ideas have made him a target of the local church, which would rather people looked at the feet of the priests than at the skies above. The historical parallels of this tale are obvious but the targets of Simone's criticism aren't. While Sonja herself believes this stargazer to be a madman, her anger is reserved for those who would mistreat another over a belief that does no harm to others. The tale is not Science versus Religion but Spirituality vs. Theocracy, as Sonja considers the simple faith practiced by her family in a humble hut of a church compared to that practiced by the priests hidden away in a great stone temple with golden statues. The parallels to the modern conflicts between small churches and the mega-churches that are run like big business are inescapable. Walter Geovani captures this all with his usual flare. His linework is simple, yet filled with subtle detailing. His inks are perfect, being just dark enough to add definition without obscuring the fine pencils. Simply put, this book's artwork is stunning!